At a Hackathon people meet to solve a specific problem in a given period of time. That period in most cases is a weekend and the group of people counts about 30 attendees. On the first day topics will be collected and the attendees vote for these topics. Projects with the most votes will be worked on in the coming hours. The Magento Hackathons often take place in offices of agencies, youth hostels or hackspaces. The organisational team coordinates the supply of internet, food and drinks. Every morning and evening the different groups present their progress to the audience. The Hackathon ends if you’re too tired, the sun rises or it’s sunday afternoon. In most cases there is some incentive event. Interested? Then go ahead and sign up for the next Magento Hackathon. What is the origin of the Magento Hackathons? The first Magento Hackathon was organized by Damian Luszczymak in 2010 in the German city of Herford. The group was very small at that time. There have been 9 developers and we met in the facilities of public high school Herford. The primary goal was to have a developer meetup for exchanging ideas and get to know each other. After that weekend we had been very enthusiastic. We decided to repeat that kind of event, so meetings at Tossens at the German north sea coast and in the city of Essen took place in 2011. After that it was clear that we should do that on a regular basis and more public. 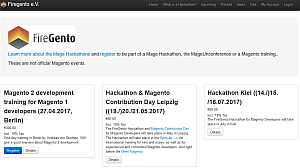 The Magento Hackathons in and around Germany were born.